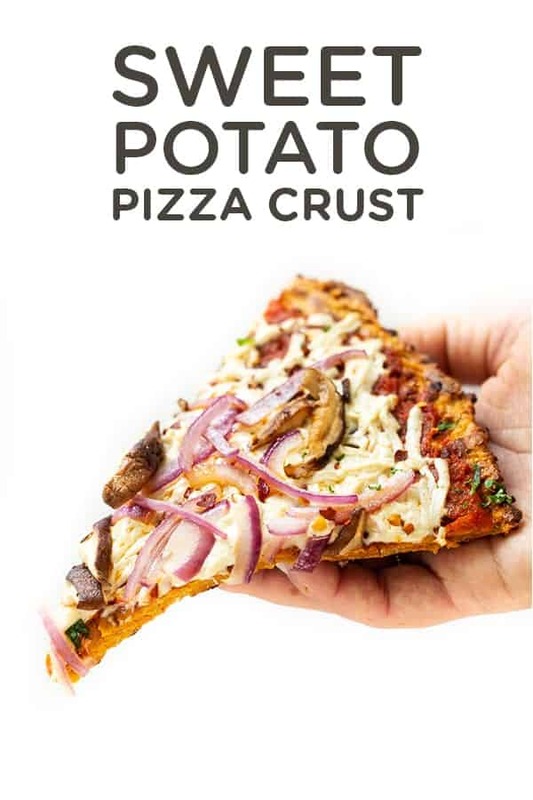 This easy sweet potato pizza crust is life changing. It tastes amazing, it's super healthy and it's simple to make. It's also low calories and gluten-free! Okay, this recipe is about to blow your mind! I don't think I've ever written those words here before, but I mean it this time. 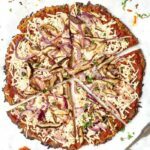 This sweet potato pizza crust is life changing! Not only is it easy to make, but it's also delicious, it's healthy and it's sturdy enough to hold all your favorite toppings. And it's naturally gluten-free! 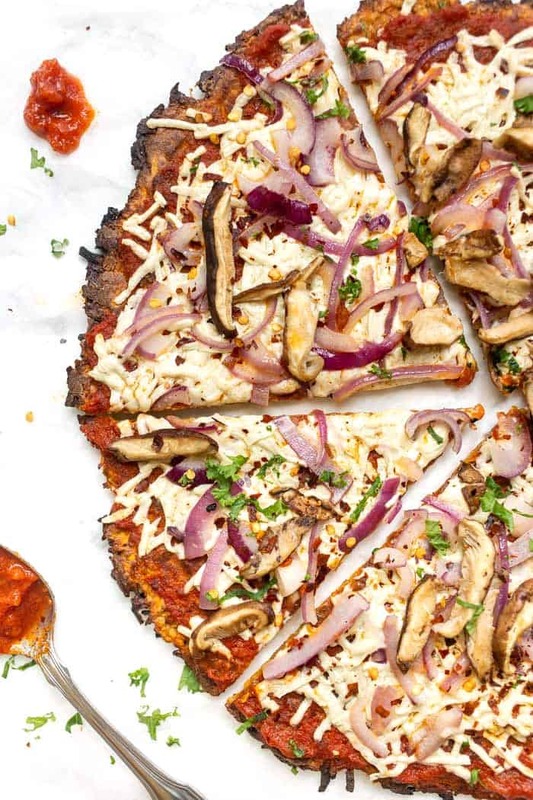 We've shared a lot of healthy pizza crust recipes over the years, but this definitely lands in the top two. 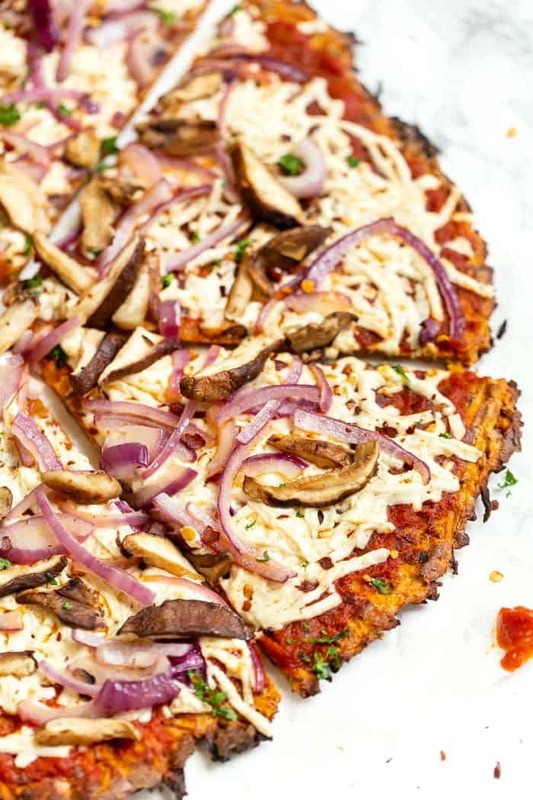 I think my numero uno is my 5-Ingredient Quinoa Pizza crust, but sweet potato pizza crust definitely comes in at #2 or #3. One of the pizza recipes you might remember is the zucchini pizza crust that I shared over the summer. Well, the concept of this crust is similar but since we're using sweet potato as the base, it ends up getting crispier and can be made easily all year round. The crust is simple: we're using grated/shredded sweet potato, mixing it with a little quinoa flour, adding in some nutritional yeast and garlic powder for flavor and then binding it all together with some eggs. Once you bake it up, it turns all nice and crispy and delicious! Once you've got your pizza “dough” together, it's time to get a little dirty! Since the dough is kind of wet and sticky, we're going to be spreading it out with our hands. I like to just put it onto my baking sheet (lined with parchment of course! ), and then lightly wet my hands. Slightly wet hands will prevent the dough from sticking to you and will help you spread it out more evenly. Once you've got it spread out – you can make it into whatever shape you want – it's time to bake it! I baked this one at 400ºF for about 25 minutes before flipping it over. You definitely want to cook it on both sides so that it has the chance to get crispy on both sides. From there, let it bake a little longer to make sure it's cooked through, and then move on to your toppings! I think for your sauce, you could really go with anything, but since sweet potato is on the sweeter side, I felt like a tomato sauce made the most sense. So just spread a thin, even layer of sauce onto the crust and move onto your cheese. Since I don't' eat dairy, I have to use a vegan cheese. I'll be honest and tell you that I really don't think there's a great vegan cheese out there yet. Unfortunately, most of the ones on the market taste pretty fake and are full of crappy ingredients. For me, I think of vegan cheese as an occasional treat, not something I would eat regularly. If I had to choose those, Parmela Creamery is my favorite! Finally, just pop that pizza back in the oven for 5 – 10 minutes until your toppings are cooked through and you're ready to dig in! 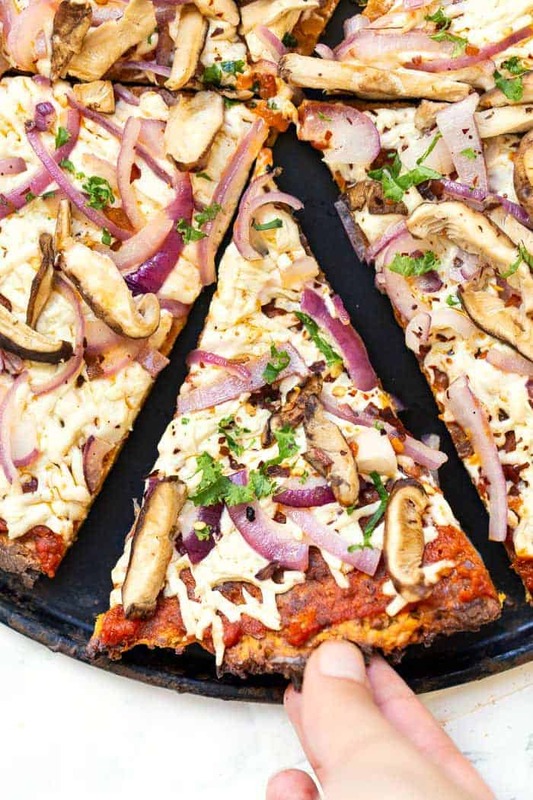 This easy sweet potato pizza crust is life changing. It tastes amazing, it's super healthy and it's simple to make. Will quickly become your go-to! Preheat the oven to 400ºF and line a baking sheet with parchment. 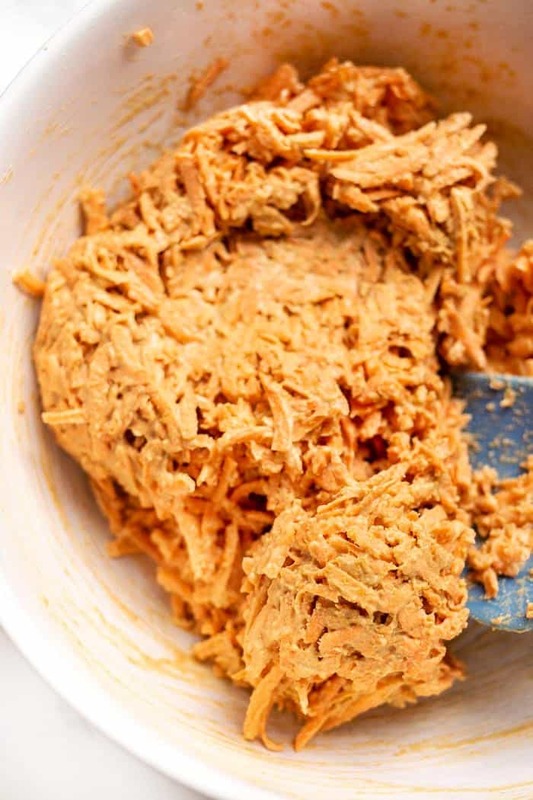 Add the sweet potato to a bowl, along with the flour, nutritional yeast and seasonings and stir until the sweet potato and flours are evenly combined. Add the eggs to the bowl and stir to form a sticky dough. Transfer the dough to the baking sheet and spread the mixture out using your hands to form a thing pizza shape (about 1/8" thick). Bake on the center rack for 25 minutes, then flip and bake for another 15 minutes. Remove from the oven and top with your desired toppings, then bake for another 5 - 10 minutes until the toppings are cooked. Allow the crust to cool for 10 minutes before slicing and serving. If making this vegan, replace the eggs with two flax eggs. The dough will be very sticky so make sure to also spray your parchment generously with cooking spray. For baking, bake for the entire 30 minutes on side, then flip and cook for another 15 before adding your toppings. Thank you for this! Question: Are the calories listed per slice? To prevent overdoing it, I am asking 😉 looks great. Wow I need to try this recipe! Thank you! Does it matter if I use oat flour and will texture be affected? Also, I dont have nutritional yeast in my pantry. Is anything else affected other than taste if I dont add it into the recipe? LOVE your ideas! Ive been getting tired of making sweet potato the same way for meal prep and have 3 small ones left sitting in fridge. I would say you can def use oat flour, so try that but maybe use a smidge more to help offset the nutritional yeast. If you can tolerate dairy, you could also use parmesan instead of nutritional yeast!